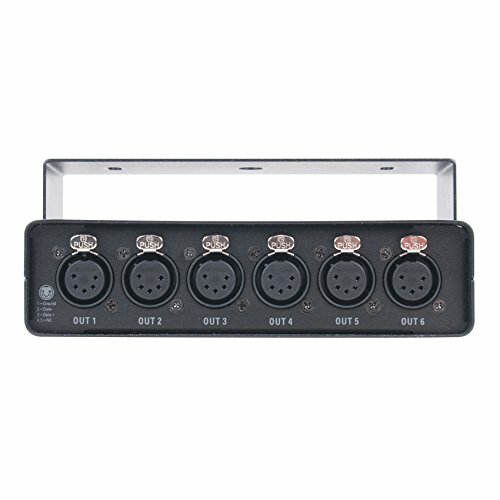 The RDMX6S is an easy-to-use RDM E1.20 compliant 6-way RDM/DMX data splitter featuring a 5-pin DMX input, a 5-pin DMX loop thru output with built-in termination, and 6 opto-isolated 5-pin DMX outputs. Housed in a die-cast aluminum housing, it features a multi-voltage universal auto-switching 100V to 240V power supply, and includes a single unit mounting bracket for truss/clamp installation. Optional single and dual unit rack mount kits are available. If you have any questions about this product by Elation Professional, contact us by completing and submitting the form below. If you are looking for a specif part number, please include it with your message.